It’s time for you to write your business book. This guide will get you there. 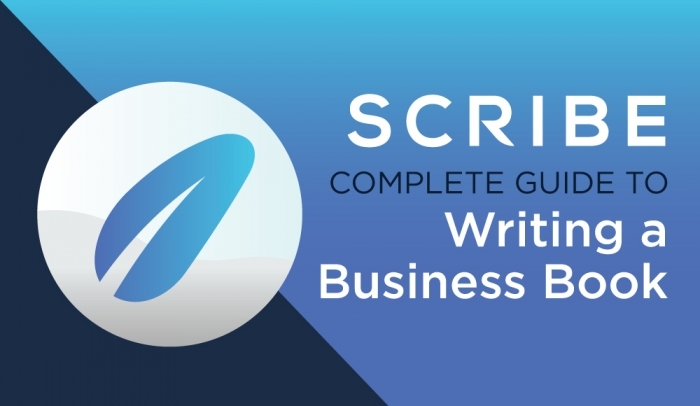 I’ve personally written 4 New York Times Bestsellers (3 of them hit #1), and my company, Scribe, has helped over 1,000 authors write their business books in the last 4 years. We have a tested and proven method that will get you from idea to finished book, and I’m going to lay it all out for you. This is our exact method, step-by-step. No more delaying or avoiding or excuses. If you follow the process outlined here, you will get your book done. IMPORTANT: This guide is only for writing a nonfiction business book. This process is designed for entrepreneurs, executives, coaches, consultants, business owners, or anyone similar. It only works for the types of books they write: nonfiction, informational, prescriptive, how-to books that also involve some personal storytelling and are used as a way to share their knowledge. Before you start writing your book, let’s talk about what can you expect during this journey. Don’t skip this section. Probably the #1 thing that separates those who finish their books from those who do not is having the proper expectations going in. Because writing a book is hard, and if you’re not prepared for that fact, you’re far more likely to quit. But if you know the difficulty of what’s coming, you can mentally prepare to get past those obstacles when they come…and they will. Anyone who tells you that writing a book is easy is either trying to sell you something, has never written a book, or writes really bad books. Books are hard to write. And writing a good book is even harder. To overcome this, you’ll need to work hard. Yes, this should be obvious, but there are many people who seem to think, if only subconsciously, that there is some “trick” to make writing your book easier. There’s not. There is no hack or trick or workaround. If you want to write a good book, then expect that it will require hard work from you. Writing is tiring (especially if you do it correctly). Expect to get tired when you write, and expect that it will drain you. Make sure to take the steps you need to be both rested and energized when you write. I can’t tell you precisely what to do for proper self-care; that all depends on you. Maybe going for a walk with your dog is fine, maybe you need to get more sleep. The point is not the details, the point is to know it’s coming, and doing what you need to do in order to prepare. Writing a book is inherently confusing. It is not easy to properly position and structure a book, not to mention the actual writing. On top of that, this book will tell you to do things you’ve probably never heard before, or will give you advice that seems counterintuitive. If you approach the instructions here like Daniel did in The Karate Kid, you’ll be great. If you didn’t see the movie, in The Karate Kid, Mr. Miyagi had Daniel do a bunch of isolated tasks that seemed to have nothing to do with karate: painting fences, waxing cars, etc. Daniel got frustrated and annoyed. But then, when he started doing karate, he realized that those seemingly unconnected movements formed the basis for karate. This book will be similar. The exercises I put you through might seem disjointed at first, but by the end, you’ll see how they all come together. No effort is wasted. The exercises are designed to build your book efficiently from the ground up, the first time—as long as you have the discipline to walk through them and do them right, it’ll work. This is a big one. Writing a book will unquestionably push you emotionally, and expose fears and anxieties—and that’s something that is very difficult for a lot of authors to deal with. Writing a book will make most authors face some of their fears. That is never easy and never fun, but if you want to write a book, it’s almost certainly going to be a necessity (don’t worry, we have a whole chapter about what fears are coming and how to deal with them). A quick example: we worked with a UFC fighter. This is a man who hits people in the face—for his job. The book was about anxiety. He came into the process knowing he’d have to be vulnerable in order to really explore his subject matter, but being vulnerable was not something he was used to. In fact, any conversation that touched on him revealing anything personal or “weak” was, at first, totally outside his comfort zone. Quite frankly, he was afraid. We helped him work through his fears and have those uncomfortable conversations, and he finally opened up about a mental breakdown he’d had in a way that truly benefited his readers. And, in the end, it benefited him personally, too. Not all the expectations are bad. Even though the process of writing a book will challenge and stretch you, the actual product that you are left with—your book—will be an amazing addition to your life and career. When you write your book, so much changes. First off, once it’s done, it’s done, and it’s with you forever. Second, it shows you can commit to a difficult goal and then follow through to get it done. Third, it will raise your authority and credibility in your niche. Fourth, it will raise your visibility and prominence in your field. And last, it will enable you to leave a legacy behind that helps other people. It is proof of your work and proof of your knowledge—one that will help and empower other people in their journeys. This is no joke. Your life—and the lives of your readers—will be much better off when you write and publish your book. Positioning is the most crucial part of writing (and marketing) your book. Do not breeze over this section or take it lightly. If you put in the work to properly position your book now, you will reap the benefits for years. Simply stated, book positioning is the place your book occupies in the mind of your reader, and how that reader perceives your book as fulfilling their needs. Book Objectives: What result must the book produce for you to be a success? Book Audience: Who is the audience that must be reached for your goal to be achieved? Book Idea: What is your book about, and why will your audience care? Imagine it’s a year or two after your book has been published. What have you accomplished because of the book? 1. Raise Visibility/Profile: increase visibility in any number of ways, like making it easier to gain media exposure or other forms of attention. 2. Increase Authority/Credibility: help an author establish authority and credibility within their field. 3. Get New Clients/Opportunities: generate new business and other opportunities across a variety of platforms and venues in multiple ways. 4. Speaking Engagements: a book is almost a necessity for becoming a paid speaker, or even getting booked for any speaking at all. 5. Leave a Legacy: establish a legacy and pass your story on to others. Once you understand your objectives, the next step is to understand your audience. Why? It’s simple: for your book to reach your objectives, it must appeal to an audience. Books must have readers to be effective. Who most needs to read your book? What pain is this person experiencing because they have not read your book? What benefit will this person get from reading your book? Now it’s time for the fun part: nailing down your book idea. Book ideas often shift once the objectives and audience become clear, so we leave this task for the end of the process (minus the writing itself). It’s much easier now to get your idea right, because you know exactly what you want to accomplish and what audience you must attract with your book to reach your goals. The final question: What is your book about, and why will your audience care? Before you answer, be sure to avoid the biggest mistake that authors make: Don’t write the book you want your audience to read; instead, write the book your audience wants to read. This is a subtle yet very important distinction. To be well positioned, the book has to be what your audience wants to read, not what you want them to read. If you can answer the next two questions well, then it should be positioned properly. Your outline is the structure of your book, and thus incredibly important. If you start writing without a structure, the process will take forever and the product will be haphazard and incomplete. Worse, having no outline often leads to not finishing your book at all. If brainstorming is hard, use the “teach your book” framework to help. Begin with your ideal reader—someone who is in the audience that you described in your positioning. Now, imagine teaching them everything in your book. What are the major lessons? What is step one? Step two? How would you explain your process to them? What would they get confused about? What points do they struggle with? What lessons have you conveyed to them? What did they find particularly helpful? What questions do they ask you? Write it all down. The beauty of “teaching your book” is that it’s an excellent frame to articulate the knowledge you have that you may take for granted. Using the chapters you created, now create an outline. Do not go crazy with this and try to create a massively complex outline. That won’t help you. It only slows things down. Here is the simple structure that we use. It lays out the various elements you’ll need for each chapter. Just fill in the information, which you will use as your guide to write each chapter. This should be a personal story, historical anecdote, question to reader, shocking statement, or anything that draws in the attention of the reader and sets up what is about to come in the chapter. Once you have a set-up, then you plainly state what will be taught/discussed in this chapter. Essentially, you tell them what you’re going to tell them. This section should list all the key points/evidence for the argument/factual content. This is the bulk of the section. You can do this quickly and succinctly, but the outline of the chapter should be laid out fairly well. Make sure you look at this section from the vantage point of your reader, rather than your own. Your reader is not the expert, you are, so this section needs to be tailored to them. Effective stories are crucial to the success of a book. They’re a great way to make the book and its specific takeaway points more memorable. This does not mean that in your book, you write your supporting evidence and then your stories. Of course you will integrate stories and supporting content. We recommend separating them in the outline, simply because it’s not always clear which stories you want to use and where. This should be the summary at the end of the chapter. It clearly lays out what the reader needs to know. It took me about three years being a professional writer before I understood that I needed a writing plan for every book I wrote. Writing without a plan is like going on a cross country trip without a map. Yeah, you might get there, but it’ll take you at least twice as long as if you’d just taken a map with you. You must start by picking the exact time and place you will write each day. For example, you could write every day from 8 a.m. to 10 a.m., in your home office. Or 3 p.m. to 4:30 p.m., at Compass Coffee. We recommend writing for at least one hour per day. If you only have 30 minutes per day to write, then do it. But generally speaking, it’s tough to get much done without an hour carved out per day. In addition to scheduling the time and place of each writing session, we recommend giving yourself a specific writing goal for each session. We recommend giving yourself a goal of 250 words per hour of writing. Why 250 words? Because 250 is approximately the number of words per page in a printed book. Only writing 250 words a day, you can get a 120 page book done (30k words) in about 4 months. That is very fast, and you’ll do it by only asking yourself to write one page a day, with what feels like very little effort. A big part of getting something done requires a deadline. Deadlines force action and demand accountability. If you want to move very fast, give yourself a deadline of about a chapter a week. If you want to go a reasonable speed, give yourself two weeks per chapter. If you want to go slower, three weeks. And if you have a hectic life, do a month per chapter. Now go put those deadlines in your calendar. Right now. Write your first draft as quickly as possible. Don’t stop to edit. Just keep moving forward until your rough draft is done. Write your first draft as quickly as possible. Keep moving forward until your first draft is done. I cannot be more serious or literal about this. If you stop and edit as you write the first draft, you will never finish it. Writing is very much about momentum, and if you have a schedule and follow it, and just keep going, then I guarantee you will finish your rough draft. Manually Edit: Make changes directly in the document. Read Aloud: Read the manuscript out loud—preferably to a person or recording device. What point am I making in this sentence? Is it as short as possible? Did I leave anything necessary out? Repeat that for every paragraph, then every chapter, and you will ensure your book is on point and says exactly what you want it to say. This is an editing process that’s not commonly taught, but is a secret trick of numerous bestselling authors. Brené Brown, Neil Strauss, myself—we all do this. I learned this when writing my first book. I probably manually edited it at least 50 times. At least. I thought that there was no possible way I could change anything or make anything better. And then when I went to record my audiobook two months later, as I read it out loud, I found at least 100 tiny little mistakes and changes I would have made. The reason that reading your manuscript out loud works so well is because you will catch dozens of things you would have otherwise missed. Hearing yourself speak forces you to notice bad or strange phrasings—even if you don’t why it’s off, you know it’s off. Basically, if it’s something you would say out loud, then it usually reads clearly on the page. If it’s something you would never say to another person, it tends to not read as clearly. This guide is about writing your book, not publishing, but I wanted to put this in here to be clear: writing the book is only about 70% of the journey. Publishing is a big part of it, and without publishing, writing it is not worth it (for business books, at least). The main question we get is about traditional versus self-publishing for business books. This is answered fully in our guide to choosing the right publishing option.